Abstract. 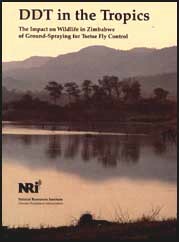 The environmental impact of DDT used in ground-spraying operations to eradicate tsetse flies from north western Zimbabwe was assessed in field studies between 1987-1991. Fauna monitored included populations of bats, birds, lizards, fish and insects; microbial processes contributing to soil fertility were also checked. Despite the relatively low application rate, and rapid dissipation of residues, adverse effects on a landscape scale were found in populations of four bird and one lizard species. The comparative scarcity of several bird and terrestrial invertebrate species in sprayed areas may also have been due to DDT. Residue concentrations in at least 5 bat species posed a significant risk to survival during drought. No significant effects were detected in fish or on soil processes. Effects on the majority of scarcer species are unknown. The effects are reversible, probably within 10-20 years, and are less serious than those caused by habitat loss due to human settlement and elephant damage. In economic terms, the environmental damage cost of using DDT for tsetse fly control was very low. DDT residue burdens in humans were not monitored in this study but the domestic use of DDT for mosquito control is probably a far more important source of exposure in man. The adverse effects of ground-spraying with DDT can be mitigated by alternative control techniques or by substituting deltamethrin, a less persistent insecticide, for DDT. However, if substitution increases costs significantly, wildlife conservation would benefit more from the retention of DDT and investment of savings in projects to manage wildlife habitat than from substitution. Although the book was published in 1994, a web text was made available this month. The relative abundance of common species was assessed by timed point counts at regularly spaced sites along tracks through sprayed and unsprayed areas at Siabuwa in Zimbabwe. More detailed surveys were made of the White-browed Sparrow Weaver Plocepasser mahali by nest counts. A closer study was made of DDT residue concentrations in seven bird species, including the sparrow weaver, over spray treatment, time, feeding strategy and diet. In sprayed areas, high residue concentrations were associated more with feeding site than diet. High concentrations were found in the sparrow weaver which feeds on the ground but mainly eats seeds. Colony density was estimated as 60/km2 in the south and 48/km2 in the north of the study area. The book has a paragraph on the weaver survey, with 2 figures (5.8, 5.9) but these figures are not included in the web version.